Life threw us a curveball , which was expected but also unexpected.I should have suspected something when I couldn’t stomach coffee anymore! Appearance of a faint second line was not enough confirmation for somebody as paranoid as us so an unnecessary blood test proved that we were indeed expecting! Looks like the whole30 program created the best possible environment for this to happen and we couldn’t be less ecstatic about it. What we didn’t expect was the all time sickness (there is nothing called morning sickenss-if only you were so lucky!!) .I couldn’t stand the sight of most of my favorite foods! Forget eating chicken but just the smell of it had me running to the other room! My favorite kali dal gave me the heebie jeebies! I hated onions, garlic, eggs, milk, non vegetarian and everything good in the world!! My diet mainly consisted of crackers, crackers and maybe a toast with butter (ok a lot of buttered toasts as attested by my weight gain).Once an elixir to me, coffee became the most nauseating smell in the world. Vomiting became so commonplace for us in those three months that after the first twenty times my husband stopped running to the bathroom along with me. So obviously I couldn’t blog about anything! The next three months went almost easy and breezy. My diet was mostly a vegetarian north Indian diet without onions, garlic and ginger. My morbid fear of chicken and egg haunted me for another two months and when I was able to stomach some chicken , we celebrated!! One day Abhishek came home to find me making 2 kinds of chicken and pork just because I could!! And he almost cried (ok he danced a bit and told anybody who would listen that his wife was back from the purgatory!). But all celebrations have a closing ceremony and mine was the insulin resistance test. I always thought I would be susceptible to this and so I tried to do my penance before hand. I lost a bunch of weight with the help of whole30 and exercised but like a persistent ghost it accompanied me to my 24 week of pregnancy. Only instead of a friendly ghost I got the scary kind with daily insulin shots and James Bond inspired equipment! If not an explosion I can defiantly cause some extra squeamish kinds to recoil from the drop of blood that I can yield from my magic pen! (Read my husband here:D). Now coming to the point of this blog..FOOOD! This recipe is a faux couscous made out of locally available Foxtail millet.I tasted this recipe last week at a friend’s house and I was immediately enamored! 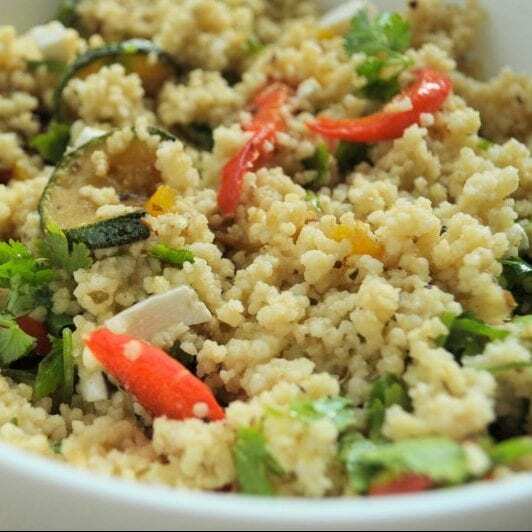 It was a wonder how she converted this humble millet into a fancy couscous salad for her Mediterranean feast.It’s a small kind of grain with high glycemic index and glutenfree which makes it perfect for people with diabetes. Add the vegetables with salt to taste and oregano. Saute till cooked. Using a folk gentle mix the vegetables and millet.Add the cheese. Drizzle extra virgin olive oil and mix well. I found you on the Whole30 website and got great inspiration for indian inspired food for my first whole30! Welcome back and hope to see some awesome recipes.. Starting my second round of whole30 this monday, so will look for inspiration here. And wish you good luck for the rest of your journey to motherhood! Thank you Sonali.Its great to know that my food helped you through your whole30 journey.Best of luck for your second round.